Looks a bit like an oversized BlackBerry! 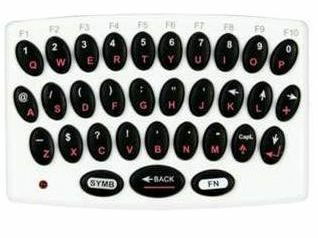 If, like us, you've been crying out for a decent keyboard to assist your Opera browsing, friend code inputting and other text-entry stuff on your Wii, then you will be glad to know that Logic 3 is bringing out this handy little 32-key wireless QWERTY keyboard. The rumours also suggest that Monster Hunter Wii – one of the biggest gaming franchises in Japan right now – will also support text chat amongst players. So a keyboard is going to be even more of a necessity to play that must-get title. Logic 3's miniaturized Wii keyboard looks akin to an oversized Blackberry. A USB dongle pops into your Wii console offering a 2.4-Ghz wireless connection, with the keyboard powered by two AAA batteries. You can pre-order one now on Amazon at a cost of £14.99, to get one on release day of 18th July.